Openreach (BT) has today unsurprisingly announced that Huawei and Nokia have been awarded key contracts to deliver the new electronics (headend) that will support their on-going “Fibre First” project, which aims to roll-out 1Gbps capable Fibre-to-the-Premises (FTTP) broadband to 3 million UK premises by the end of 2020. The network operator has a strong history of working with both companies, particularly Huawei (e.g. heavily used for both VDSL2 / FTTC and now G.fast), and as such today’s announcement won’t come as much of a surprise. As for the FTTP side of things, exchange based headend equipment (explained at the end of this article) from Huawei is already being used and Nokia is expected to start installing their own similar kit from July 2019. Diversifying your supply chain like this is a fairly common practice, as opposed to the risks of sticking all your eggs into one basket. We should add that a lot of the kit being played with as part of EE’s (BT) future deployment of 5G Mobile technology also comes from Huawei (here) and they’ve already picked Nokia’s new ReefShark chipsets to support that side of things (here). Openreach’s “full fibre” FTTP/H network currently covers just 560,000 premises (here) but the operator is working to ramp this up, which is supported by their recent move to hire a further 3,500 engineers (here). The initial deployment is focused upon up to 40 UK towns, cities and boroughs, with Bristol, Birmingham, Cardiff, Edinburgh, Exeter, Leeds, Liverpool, London and Manchester having already been confirmed. The operator also harbours an aspiration to reach 10 million premises by around 2025, although they’ve previously said that this may only be possible with support from other ISPs (difficult since so many are now doing their own builds), as well as softer regulation, reduced logistical barriers (improved planning, wayleaves etc.) and the ability to switch-off old copper networks as areas move to FTTP (expensive and complex). However an agreement on the above is looking increasingly likely but may hinge on the Government’s forthcoming review of future telecoms infrastructure (due imminently). We should add that deploying FTTP isn’t cheap and Openreach has already indicated that covering 10 million premises in the future could cost between £3bn to £6bn (full details). NOTE: The headend is located in the Openreach exchange and acts as a digital gateway, managing and translating high-speed data signals between customers’ premises and the wider network. Data from the customers premise is contained within virtual pipes that are individually identified by a unique tag. The tag is like an address that allows the headend equipment to work out where to send the data so it successfully reaches the ISP’s network. The kit supplied by Huawei (MA5800-X17) and Nokia (ISAM FX-16) will be installed in the part of an exchange known as a Handover Point. Both pieces of equipment are physically installed into one of Openreach’s standard headend racks within the Openreach Handover Point. Do nearby area’s stand to benefit from this as well? For example Wirral for Liverpool as Salford for Manchester? Sadly we don’t usually get such detailed coverage plans like that directly from Openreach, although it’s worth remembering that they don’t tend to cover 100% of premises in every area they announce (at least not in the first pass). Sometimes it can take years to extend out to an entire area, assuming they even do that much. Is roll out of FTTP(H) to the majority of households just a pipe dream? I’m not a Broadband officianado but won’t it require the wholesale digging up of roads to the individual premises and/or replacement of overhead lines? This is a monumental cost and time consuming challenge if this is the case. Or have I got this wrong ? AS openreach have ducting installed already, in theory it should be ‘easier’ to replace the copper with fibre. 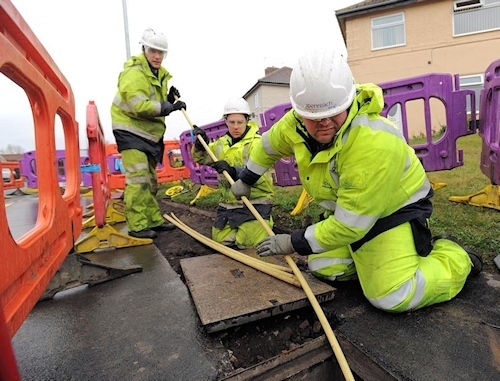 The main delay in rolling out FTTP across the UK is due to the disparity of requirements between councils and the procurment of wayleaves to install in unadopted locations. You have neglected to mention that openreach currently use ECI head ends as well as Huawei. I’m slightly confused about this new headend kit and its’ roll out plan? Earlier this year, my line was regraded as up to 1000Mbps downstream. Do you know if Openreach been replacing older kit from the trials period or has the original headend kit always been capable of higher speeds? There is a public announced general project on to unify and simplify OR multitude of legacy networks. Which is pretty sensible as otherwise you have to have different groups of people understanding different type of tech which makes it hard to scale. Bit hard to understand though as you haven’t said what it was upgraded from? As you are saying 1Gb I assume you have a leased circuit? If it was around 850 before it would probably have been some kind of ethernet type limitation. As that is the sort of realistic throughput you get on a 1Gb ethernet connection once overhead and management are allowed for. No it’s FTTP – the subject of this article and was previously maximum rated at 330Mbps. I should have perhaps added the caveat that it is the DSLChecker results that are upgraded.not my physical line. Absolutely no need currently for what ever marketing term for the 1000Mbps service is. Happy at slower speeds for now and the lower costs. Well it can only be a good thing if the head ends are being upgraded so that other bandwidths and profiles can be supplied to interested CP’s. In the longer term this gives OR the ability to differentiate a wider range of products in the pure software domain. Which might do something to mitigate the painfully long dev and testing cycles that OR go through at present. Anyway I am wandering off topic here. And again BT plan to upgrade current high speed users to even faster speeds. Rather than get the rest of us on EO lines sorted. If I want to speed up my download. I have to use 4g. And the wired connection is pretty much pointless for anything other than email. With the internet becoming blotted with ads and 4k video streams. I’m not usually a great OR supporter but this does make a lot of sense to me. OR’s existing fibre footprint has a huge mix of legacy technologies as it has been built up over a long period of time. OR are, not before time, training a very large number of new real fibre engineers. It makes much more sense to train the engineers to roll out a standardised solution. And to change over existing kit to the new standardised model(s) such that when things go wrong there isn’t a group of people wondering how to fix something that nobody can remember and having to phone Bill who retired five years ago and disturbing his well earned rest in the sun. As an aside EoL’s have been given a high priority in the Fibre First plan – granted not that there is a lot of detail to that. Conclusion: OR needs a fibre network that is robust and they understand: this makes perfect sense to me as part of the general ramp up. We will all be sat here in 2020 being told2025 – I am 49 and if I ever seen Gigabit in my lifetime I will be surprised.